The ProRower H20 RX-750 Home Series Rowing Machine brings commercial grade quality into your home or office at a price you can afford. The rower uses the same dynamics as you would use if you were actually rowing, and even allows you to change the intensity of your workout to fit your individual needs, without any annoying or disruptive mechanical adjustments. If you want a more intense workout, you simply row faster and harder. If you want an easier and less strenuous workout, you simply row slower and at a more leisurely pace. You can even add or subtract water to the tank to increase or decrease the intensity of your workout. The rower uses an innovative Hydro-Power Drive system to mimic rowing so thoroughly that you would almost swear you were actually rowing through water, and includes a polycarbonate water tank and an internal paddle system that actually suspends the rowing oars into the water. You can even hear the water you’re “rowing” through. The water acts as the main resistance system, just as if you really were rowing. The water’s “natural adaptive resistance” gives the user all the pushback resistance they could possibly need. 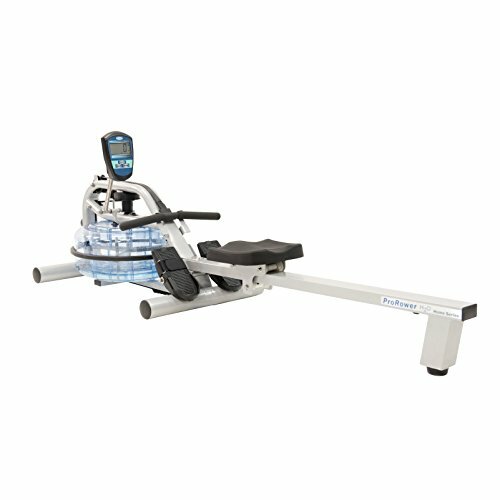 The ProRower H20 RX-750 Home Series Rowing Machine also includes an easy-to-read and oversized display panel that keeps track of such details as your exercise time, distance traveled, your 500-meter split time, your strokes per minute, the calories you have burned, and your heart rate, which works in conjunction with the rower’s built-in heart rate receiver. The easy-to-adjust and pivoting footrests are large enough to accommodate anyone, and allow you to move your feet naturally as you exercise. The rower features other impressive characteristics such as an ergonomically designed handgrip with padding for a comfortable workout, an impressive maximum weight capacity of 350 pounds that rivals many of the market’s lower to mid-range rowing machines and is quite close to the higher-end models, and a sturdy frame that folds and measures less than 20 inches by 21 inches when stored upright. The RX-750 measures 78 inches wide by 20 inches tall by 22 inches in diameter overall and weighs 65 pounds. It also carries the following warranties: a lifetime frame warranty, a three year warranty on the tank and seals, and a two year warranty on all mechanical and non-wearing components. HCI Fitness Prorower RX-750 Prorower Indoor Water Rowing Machine, HealthCare International, Inc.